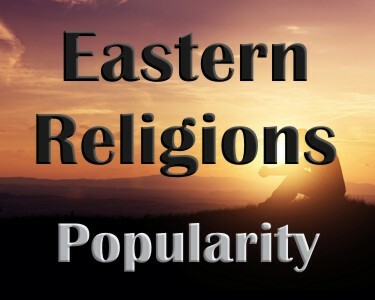 Why are Eastern Religious Practices So Popular Today? Recent surveys have shown a steady decline in the numbers of people who describe themselves as Christian in America. From this decline, we have also seen more people self-identify as having no religious affiliation. However, although many people may self-identify as having no religious affiliation, you will find in passing that everyone has a religious affiliation. The reality is that it is not one that they can readily identify, yet their words and actions reveal in most cases a tendency to have an eastern religion foundation. For this reason, we will look at why eastern religions are so popular today. When you ask this question to most people, they will give an answer that is related to some identifiable religious movement, organization, or denomination. However, when you look at the word religion in its purest form, it is easy to see that everyone has a religion that they subscribe to. They just do not identify what they subscribe to as a religion in many cases. If you look at the term religion in its purest form you find that religion is nothing more than any standard by which we base our actions and behaviors. The term “religious” is from a French word relegare, broken down into re+legare. Legare is derived from the Latin root “liga” meaning to band or to bind (1). It is the same root we get the word ligament; a band of tissue that holds together two bones. Literally, the term is meant as a binding or gathering together. In other words, it refers to anything that limits our behavior or controls us. What part does religion play in our lives? When a child is born, they normally have the ability to think. As their parents, the culture, and their human nature influences them, actions and operations of the mind begin to reason. This thinking and reasoning is sorted and categorized into deeply held convictions and feelings of truth to create an overall opinion of things or a worldview. This worldview then is the “superlink” between our thinking and actions. It is used to create our religion or standards of behavior to guide our actions. Those actions produced by our religion become an influence upon the culture. The combined effect of actions and events in our culture then, in turn, alter or reinforce our thinking (3). Without any Biblical influence, a person’s religion is based on the thinking and relationships of man, not God. Their behaviors and religious practices are humanistic in their foundations. Likewise, humanistic foundations place man in the position of being measured by the standards that man has adopted without a recognition of the superiority of God. On the other hand, if there is an insertion or engrafting of God’s Word and the Holy Spirit into the cycle, then the behaviors and religious practices can be Christ-centered in their foundations (Romans 8:5-14; James 1:21-27). These Christ-centered foundations place man in the position of being measured by the standards that God has given to man without a recognition of the superiority of man. What do eastern religions have in common and why are they attractive? Eastern religions such as Hinduism, Buddhism, Jainism, Sikhism, Taoism, Shinto, Confucianism, and others have several things in common. Some follow teachings of a historical figure. Most teach that behaviors result in some sort of rewards in this life or the next. Others believe that humans are or can reach the status of being a god. Justice is made possible by the people or some sort of cosmic energy force (4). The appeal of Eastern religions is that it is up to the individual to determine how he or she wants to live their life in comparison to humanistic ideals. The eastern religion model is focused more on the horizontal relationship between people and extolled noble living and personal virtue as demonstrated in one’s relatives or holy men. The failings of man are mostly regarded as the products of ignorance. Therefore, if you believe that there is no supreme being and your relatives or holy men were solely responsible for what happened in their history by the deeds they performed, then your standard for holiness and object of worship would be your relatives or holy men. If your god and object of worship was your relatives and holy men, your attitudes toward sin and holiness would be reflective of the imperfections and flaws of your relatives and holy men (5). Simply stated, in eastern religions if one does good things, they receive good things in return or attain a better position in their next life. This is often referred to as karma or by the popular phrase, what goes around comes around. The eastern religion focus is on the individual, not the relationship of humanity with God. Therefore, the person is his own master and does what is right in his own eyes as part of his own “spiritual journey” without the need for any sort of organizational affiliation with others. This makes eastern religions attractive to many people because they are accountable to no one, including God. They figure as long as they are better than the next guy, the forces of the universe will be good to them. With that in mind, they see eternity as either one of non-existence or one where they will be born into another life with a better status or destiny. There is no judgment. There is no one to tell you if your thinking is right or wrong. There is nothing but your own self as your master. What does God say about this religious practice? God’s Word teaches that any religion that is not centered on the gospel of Jesus Christ is the worship of demons (Matthew 4:10; 1 Corinthians 10:15-20). God’s Word teaches that none of us are good and we are all are sinners (Romans 3:10-12; Romans 3:23-24). Every deed and thought we have is seen by God and judged according to His Word (Proverbs 13:13-15; Proverbs 21:2-4; Romans 6:23). The Bible says we live one life (Hebrews 9:27). Our salvation and redemption is only through Jesus Christ (Acts 4:12; Philippians 2:10-11). Many people practice eastern religions either openly or by their practices. Some people deny they believe or have a religion, but all people have a set of beliefs that they use to live their lives. Eastern religions are popular today because there is no accountability to the gospel of Jesus Christ. This makes eastern religions attractive because people can do what is right in their own eyes. Any religion that is not founded on the gospel of Jesus Christ is nothing more than the worship of demons. Read more here: What Sets Christianity Apart from All Other Religions? Resources: Resource – Scripture quotations are from The Holy Bible, King James Version. (1) Tabor, Clarence Wilbur, Tabor’s Cyclopedic Medical Dictionary, 14th Edition, Philadelphia, PA: F. A. Davis Company, 1977, Page 816. (2) Williams, Michael L,. Silenced in the Schoolhouse: How Biblical illiteracy in our schools is destroying America. Albuquerque, NM: Wisdom4Today, 2008. Page 142. (3) Ibid. Page 143. (4) Wikipedia. (2016). “Eastern Religions”. Retrieved from Wikipedia, https://en.wikipedia.org/wiki/Eastern_religions. (5) Ibid. Page 72-73. Next post: What Does Redeemed Or Redemption Mean When Used In The Bible?